Today, my girls and I met up with Darren and his daughters (and his oldest’s +1!) at the Deerfield Fair in Deerfield, NH. We were looking for something to do that was the quintessential “fall in New England” activity, but didn’t involve hours of baking as the follow up! So an agricultural fair beat out apple picking…at least this weekend. 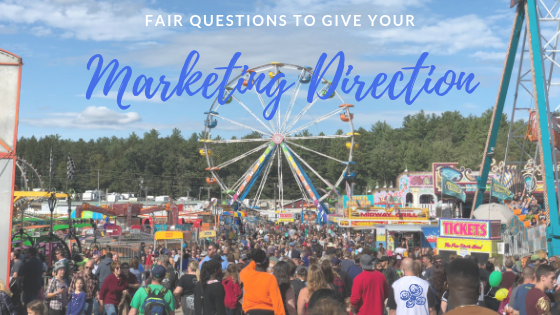 What does an agricultural fair have to do with marketing direction??? I stopped short and was like…OMG. So many people. So many spinning things. 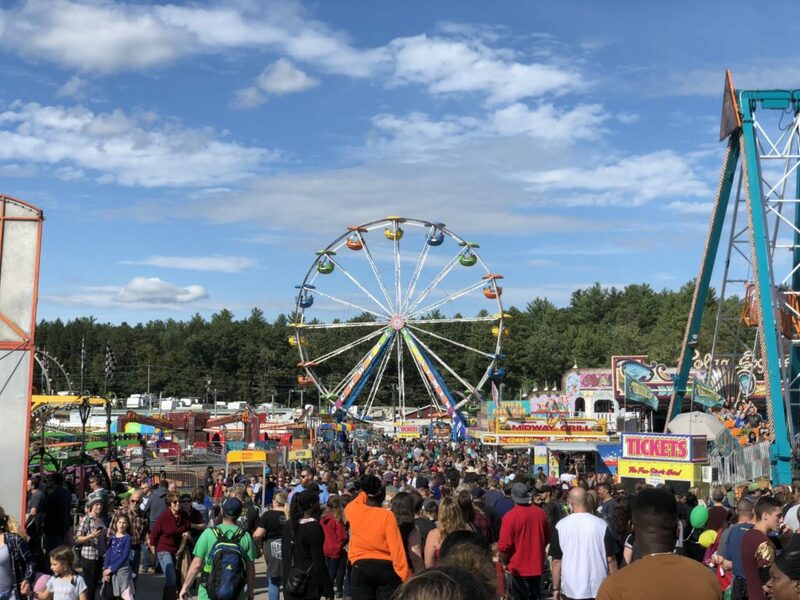 And once I realized I should stop looking at the rides going ’round and ’round so I wouldn’t get sick right there in this sea of people… I realized I have felt like this before, but not in a place like this at all. I’ve felt just like this, sitting at my laptop, and trying to write. Or watching a video on the latest marketing software. Or creating a “new and engaging” campaign. And all about the things that give your marketing direction. All of the above. Overwhelm and Confusion – oh yes. For the record, I didn’t go on ANY rides today. I’m good with all that chaos, thank you! It was even too much to watch my kids on them. Blurgh. First things first – have a little gratitude session. It doesn’t have to be long, but stop for a second, close your eyes, think about all you have done in the past week/month/quarter/year to get you to where you are. Breathe deep and feel that sense of accomplishment. Say a little thank you, fill up with gratitude, and remind yourself that anything is possible. It’s ALL possible. What is the one activity that can MOST help me reach my #1 goal at this moment? This end result of this goal is most likely growing your business, but let’s narrow that down. It could be growing your email list, bringing in another client, increasing your program enrollment, making another 10 sales, etc. What are three things I can do TODAY to complete that activity, or move the needle forward in a way that is significant and feels great? Break it down, now. These are the actual tasks that you can complete today that will help take you out of overwhelm, and put you right back into the driver’s seat. Steering right through that crowd, past the ticket booth, around the corner, and up the hill to the fresh cut french fry vendor. Yes, sometimes we need to incentivize our actions…and that’s OK!!! What is something I can do to impact my business right here, right now? Let’s start with something small. Small doesn’t always mean easy, but it DOES mean impactful. Like…closing out your Facebook tab. Just for an hour. Maybe your email, too. It can be something that helps you focus, or declutters your physical workspace so you can clear your mental workspace as well. Or maybe it’s a phone call. An item on your “really important to do list” that you’ve been putting off…but that could bring great reward. Whatever that first step is…take it. Now. Who can I tell? Accountability is one of the greatest tools I have in my entrepreneur toolbox now, thanks to the incredible tribes I’ve been a part of, past and present. Tell a friend, your partner/spouse, colleague – whomever you trust to hold you accountable with a firm kindness – and then tell them when you’ve accomplished your tasks. Congratulations – you successfully navigated through that maze of confusion and overwhelm and got yourself some fries!!! But how can you keep it from derailing you time and time again? Here’s the thing. It’s going to come up. It still comes up for me every now and then – but not nearly as often as it did before I found the right mentor and coach and tribe that give me the support, guidance, focus, direction, and more when I need it. I know what it takes to level up, and there’s nothing that fills me up more than helping others on their business journey move through the UGH and up to the AHHHHs and WooHoos!!! If you’re curious about what that could look like for you, message me and we’ll talk!